Don't Delay! If you have any questions please contact me any time during the day! You can email me at bryan@appraiserincome.com and I will get back to you immediately!!! 200+ VERIFIED Appraisal Management Companies Listed! Honestly, most of us really hate working for the appraisal management companies but want to stay in business... I don't care if I am getting paid customary and reasonable fees and no pressure or hassles. On average I make over $10,000 a month doing non-lender work ordered off my top ranking website and by completing orders for appraisal management companies. I update the list frequently and now I can easily say more than 90% of my AMC work comes from the top 37 vendors. They also offer the most competitive rates and turn around times. This book lays out all the details on how to get signed up with the appraisal management companies and additional information on creating top ranking websites. 90% of my work come from the first 37 AMCs on my list! 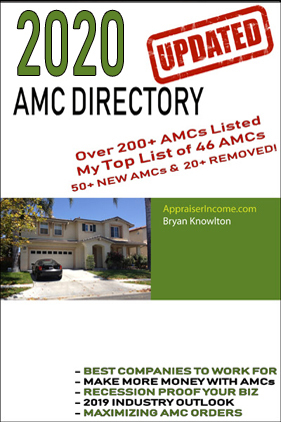 Our List of Appraisal Management Companies is a list of 200+ national AMCs that send appraisal orders. It is ordered by the companies that send us the most work at the top of the list. If you focus on the first 37 companies and get listed in their system, you will probably be completing more appraisals than ever before. *Most vendors are national unless noted in the primary areas they serve. All AMCs appear to making the push to go national at this point.